The School of Art and Design does not specify any one approach to the ceramic process, but rather organizes problems to allow the students to investigate and discover their personal approach to the medium. The curriculum for the Ceramics major is designed to expose the student to a broad foundation of technical skills. 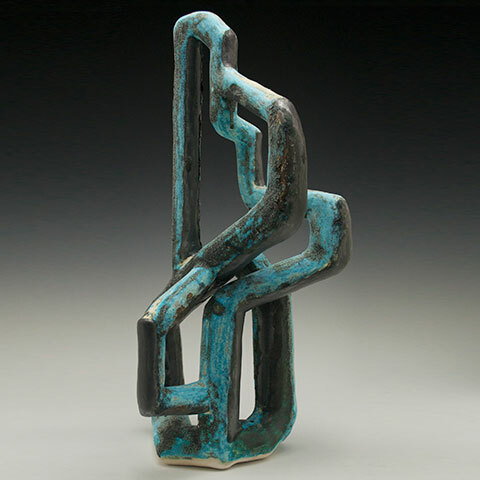 The initial courses emphasize the investigation of various construction techniques used in the field of ceramic production, design, and sculpture. Students will become proficient with traditional forming processes as well as complex mold making for sculptural applications. At the upper level greater emphasis is placed on developing and refining the technical and conceptual aspects of each student’s work. 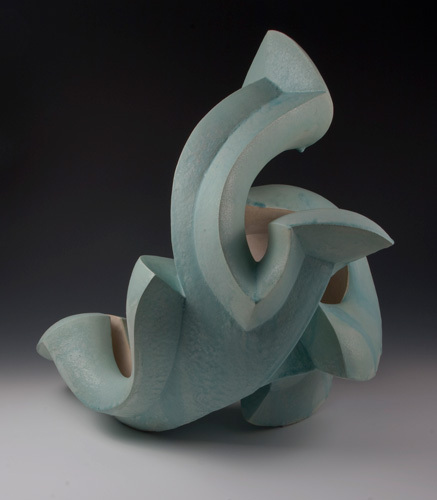 Courses focus on glaze calculation, firing procedures, and the development of a personal philosophy toward the physical and social aspects of working with clay as an expressive medium and its relationship to the larger world of art. The School of Art and Design does not specify any one approach to the ceramic process, but rather organizes problems to allow the students to investigate and discover their personal approach to the medium. 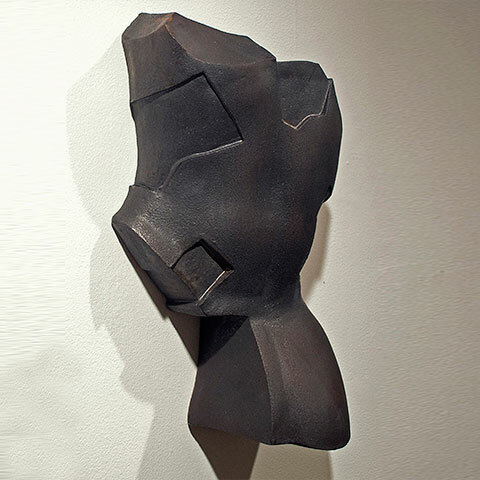 Senior BFA work in recent years has included utilitarian wheel-thrown pottery, slip-cast vessels, hand-built figurative work, large-scale sculpture, and ceramic installations. In addition to the scheduled classes, the ceramic studio is available to all registered Art & Design students during designated building hours. We offer a state-of the-art ceramic studio equipped with glaze lab, spray booth, plaster room, 15 gal. slip mixer, twenty Brent electric wheels, a large Brent slab roller, two extruders, two Soldner clay mixers, a Peter Pugger VPM-60 pug mill and a Ricoh decal printer. We have a variety of kilns, including five 19 cu. ft oval electric kilns, two downdraft gas kilns (70 cu. ft & 50 cu. ft) both equipped with oxy probes and sigma controllers, 20 cu. ft cross draft soda kiln and a 10 cu. ft raku kiln. The studio space is designed to accommodate vessel making and sculptural work, tile production, and slip casting and mold making. The upper level students are provided with personal studio spaces. A year–round program of exhibition at the DeVos Art Museum supplemented by workshops and lectures by visiting artists, enhances the student access to an ongoing dialog with contemporary art. Visiting artists include Gail Nichols, Kenyon Hansen, Julia Galloway, Stephen Destaebler, John Byrd, Keisuke Mizuno, Kurt Weiser and Akio Takamori. The School of Art and Design consists of 19 full-time faculty who are practicing artists and designers, exhibiting their work at the regional, national, and international levels. 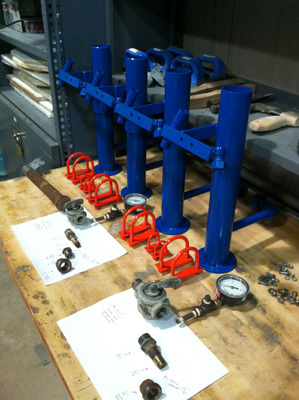 Each instructs an area of specialization and they often teach our core courses as well. The School of Art and Design offers the BFA, BA, BS, or AS degrees. 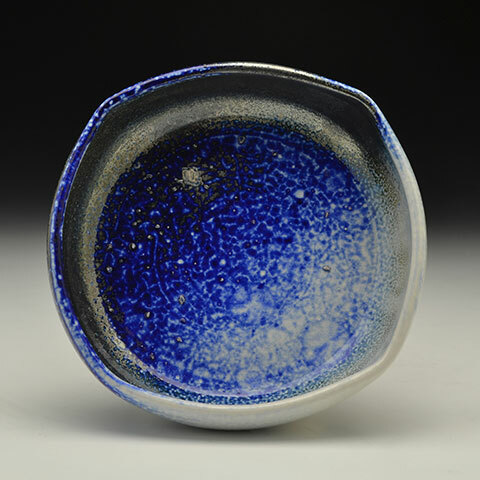 Most students elect the Bachelor of Fine Arts degree program (BFA), which includes 20 hours of specific ceramics classes, (additional work can be pursued by electing to use the Directed Studies series). Recent graduates in Ceramics have pursued careers as independent studio artists, continued on to national post baccalaureate and graduate programs, apprenticed internationally recognized ceramic artists in the field, become laboratory technicians at prestigious art centers, and have entered the industrial design field with focus on 3D rendering software and practices. The ceramics studio is a recently renovated 6000 square foot facility that can accommodate all aspects a student wishes to pursue within this medium. All areas of the studio are well ventilated and provide a safe and comfortable working environment. There are two large skylights that provide an ample amount of natural light. 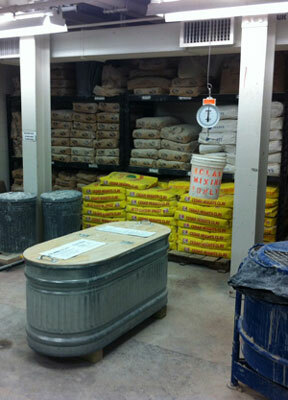 The facility is divided into four main areas: the studio, clay/glaze lab, plaster mold making room, and kiln room. The studio is equipped with 20 motorized Brent pottery wheels with individual workstations, large stainless steel hand-building tables, a Brent slab roller, Northstar extruders and Ricoh decal printer. There is a fully outfitted photographic room set up to document finished artwork. 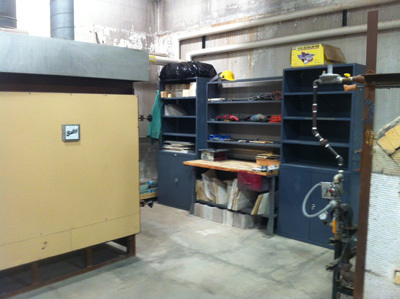 The glaze/clay lab is equipped with a materials lab, stainless steel raw material bins, spray booth, ball mill, two Soldner clay mixers, and a Peter Pugger VPM-60 pug mill. The kiln room houses two downdraft gas kilns 70 cu. ft. & 50 cu. ft. each outfitted with oxy probes and sigma controllers, 25 cu. ft. cross draft Soda Kiln, 10 cu. ft. raku kiln with a ventilated reduction pit, five 19 cu. 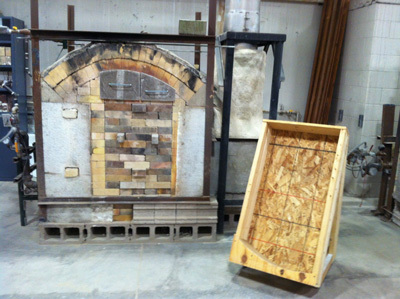 ft oval electric kilns and a test kiln. The ceramics studio certainly ranks as one of the finest university studios in the country. 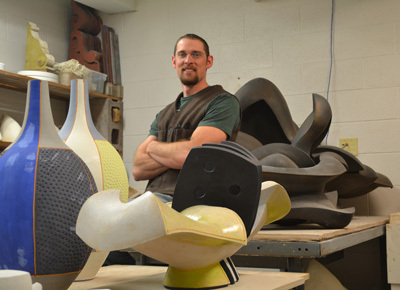 Brian Kakas is an Assistant Professor of Ceramics at Northern Michigan University. 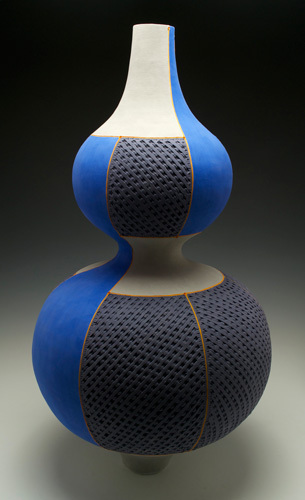 He received his MFA in ceramics from The University of Notre Dame in 2007. During his masters he focused on large-scale mold making techniques for ceramic vessels. 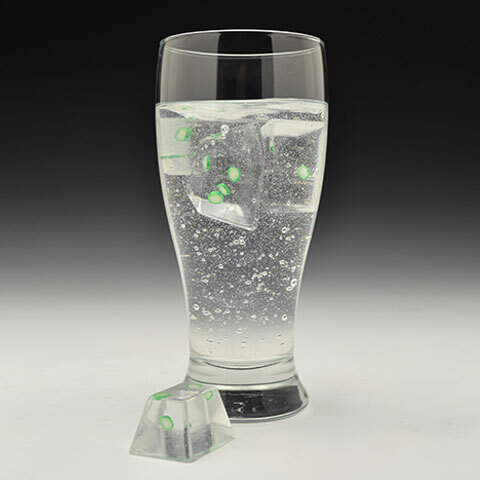 He has also studied at Maryland Institute College of Art and The University of Montana, where received his BFA. In 2002, Kakas was a resident artist at the Archie Bray Foundation. 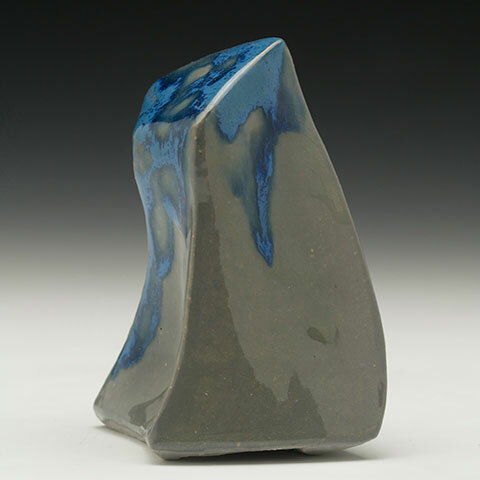 He has been in numerous solo and group exhibitions throughout the States including shows at NCECA. He was awarded the Silver Prize at the 5th Korean World Ceramic Biennale at the World Exposition Ceramic Center in Incheon, South Korea (2009). Brian has taught and assisted workshops at the Royal Melbourne Institute of Technology and Australian National University. 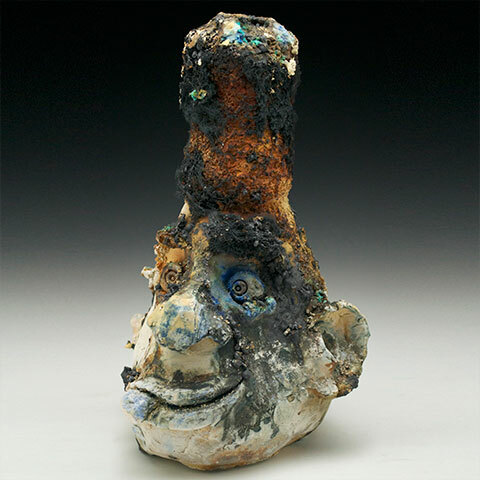 In 2009, he was invited to take part in the All China Wood Fire Festival where he built and fired sculptures at HAP Studios in Beijing and Fuping Pottery Art Village In China. 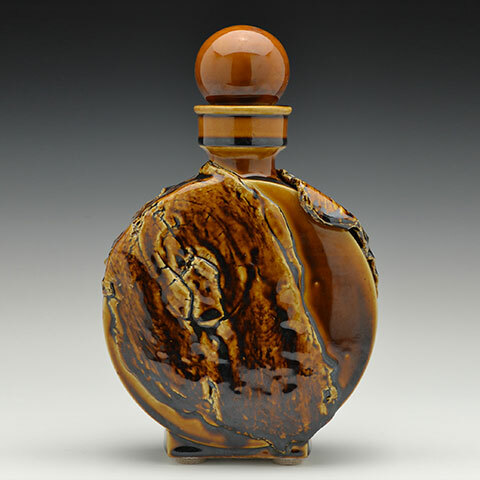 In 2010, Kakas was a full time resident artist at the FuLe International Ceramic Art Museums in China. Projects in China entailed consultation and fabrication of the new international resident artists studios and kilns. In 2011, Kakas was a resident artist and workshop instructor at the Gaya Ceramic Art Center in Bali, Indonesia. 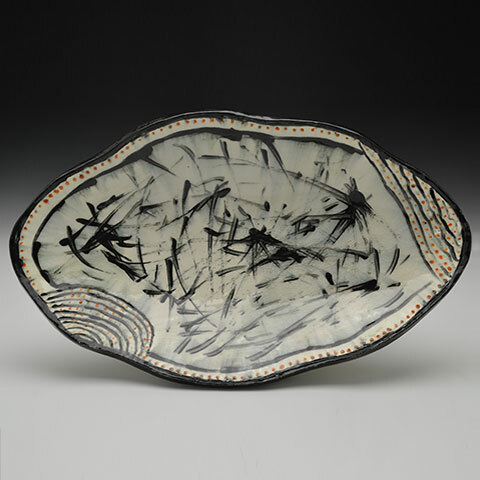 Also during 2011, he was a Demonstrator at the 45th National Council of Education on the Ceramic Arts Conference held in Tampa Bay, Florida in addition to being a resident artist at the LH Project in Joseph, Oregon. Recently, Kakas exhibited at the 1st Kaolin Grand Prix for International Ceramic Arts Exhibition in Jingdezhen, China; The Cluj International Biennale in Bucharest, Romania and 3rd Jakarta International Ceramics Biennale in Indonesia. Introduction to the methods and techniques of producing ceramic objects covering the various forming, finishing and firing techniques. Students experience techniques ranging from pinch, coil and slab construction. 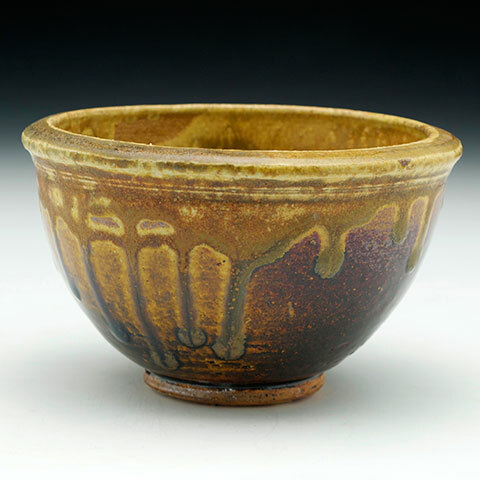 Development of the traditional skills of throwing, along with glazing and firing procedures. 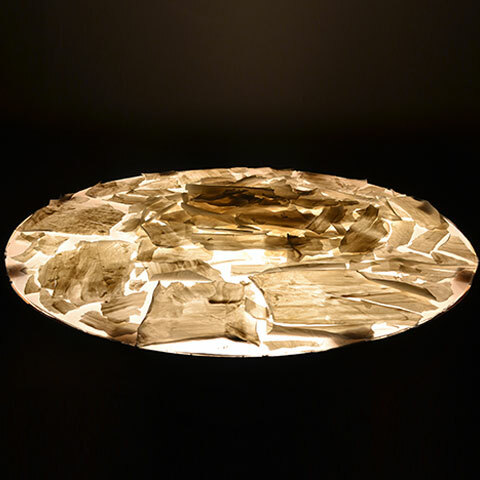 Supporting information is derived from historical and contemporary wheel-thrown forms. Production of a collection of ceramic pieces that combine traditional and experimental techniques to develop a personal approach toward the ceramic material. Emphasis is on the fabrication of mold making for the investigation of ceramic objects. Personal works will engage with thematic explorations of various cultural topics. Production of a collection of ceramic pieces that combine traditional and experimental surface concerns and techniques to develop a personal approach toward the ceramic material. Emphasis is on the finishing and technical concerns related to clay and glaze formulation along with firing procedures for the investigation of ceramic objects. Personal works will engage with thematic explorations of various cultural topics. Prerequisites: AD 303 or concurrent enrollment, AD 322A or AD 322B, or instructor permission. Production of a body of work that supports the student’s personal concern for form supported by ideological and theoretical sources. Individual solutions for construction and finishing are stressed with a focus on current trends and issues in ceramics. What is the difference between a Bachelor of Fine Arts in Ceramics and a Bachelor of Arts or Bachelor of Science? The BFA is considered the professional studio degree, as it has more credits in the Ceramics concentration and more specific requirements in studio, such as Sculpture, Drawing, Metal and Woodworking. The BFA also has more art history requirements and does not allow a minor. The BA and BS degrees provide students with the option to pursue a minor such as a major in Ceramics and a minor in Music (20 credit hours). The BA also has a language requirement. Does the school require a portfolio review before you are accepted into our programs? If you are accepted into the university you are able to pursue a degree within the school. However, you can present a portfolio to the professor in your studio area who will use your work to gauge whether you should receive advanced placement credit (replaces course and credit hours) or a waiver (replaces course but not the credit hours) or at what studio level you should begin. This portfolio can be reviewed during a campus visit or with a faculty member during an office hour during the semester. Although there is no required portfolio review to enter the program, Art and Design majors must participate and complete a faculty review of their portfolios (Individual Art Review AD 303) which is scheduled the twelfth week of each semester. What equipment is required for Ceramics majors? For the first two studio courses, AD 122: Hand-building and AD 222: Wheel Forms, a tool kit is available for purchase in the NMU bookstore. The third course in the concentration AD 322: Seminar, requires all majors to own some basic equipment, such as safety glasses, respirator, and small hand tools that pertain to specific needs of their work, i.e. electric drill, dremel rotary tool, paint brushes. All Art and Design majors are provided with an Apple Mac Book and software that will allow students to develop imagery and render forms on their laptop. What are the prospects for employment with a degree in Ceramics? Ceramics is a very competitive field of study; the employment outlook is very optimistic. As a Graduate in Ceramics a student may wish to pursue a career as a studio artist, pursue a post-graduate degree and teach in a university, follow opportunities for working with design, work within industrial application, as well as other possibilities within the ceramics field. What emphasis will I find in the Ceramics program? 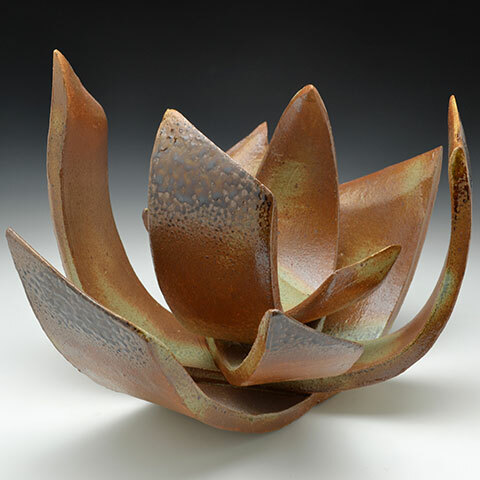 The Ceramics program presents a curriculum that exposes students to a broad experience with the material including a wide variety of forming processes, glazing, firing techniques, mold making and slip casting. Each studio course has ceramic history component that presents the spectrum of ceramics within the context of focus of the course work. 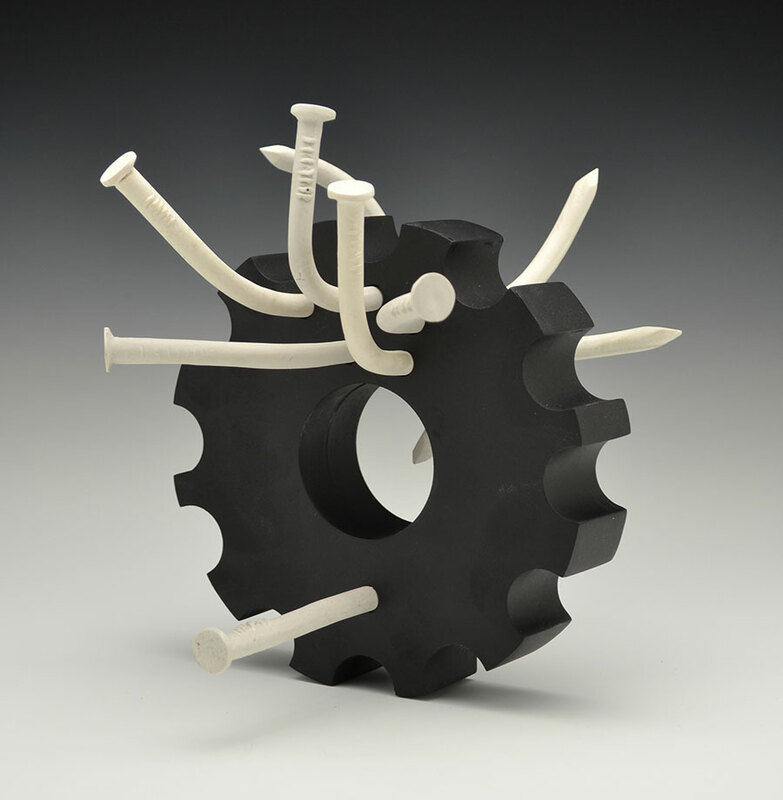 The first semester’s focus is on the physical aspects of ceramics: forming, finishing, and firing, and is geared toward sculptural techniques. The second semester’s focus is on the wheel thrown vessel. The following semester the students focus on the technical aspects of clay and glaze formulation, fine-tuning the firing process, as well as complex mold making. The final two semesters are a period where the individual student begins to focus on a personal approach to the material and develops a body of work for exhibition. Are there scholarships for incoming freshman? The school offers the High School Freshman Scholarship (four $1000 awards) that is available each year with applications due in April.